Formed in 1969 around brothers Gianni and Vittorio Nocenzi, both keyboard wizards, Banco del Mutuo Soccorso is a unique example of long professionalism and beautiful musicianship, still playing in the 2000's with the same enthusiasm they had thirty years before. Early line-ups comprised former Chetro & Co. guitarist Gianfranco Coletta (later replaced by Claudio Falco), bassist Fabrizio Falco and drummer Franco Pontecorvi (replaced by Mario Achilli). Some of these musicians had previously played with Gianni Nocenzi in Crash. Their first recordings before a stable lineup were officially released not before 1989, in the Banco del Mutuo Soccorso three-track 12" and Donna Plautilla LP, but their real beginnings are with the entrance in 1971 of new members Di Giacomo, D'Angelo and Calderoni, all of them coming from the same band, Le Esperienze, and guitarist Marcello Todaro from Fiori di Campo. 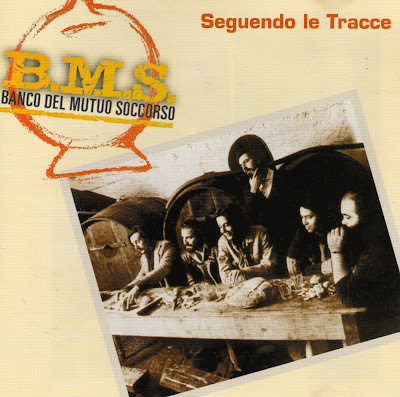 The first album, simply called Banco del Mutuo Soccorso, housed in a large money box shaped cover, is still one of the most representative examples of the italian prog, with classical influences based on the twin keyboards interplay and the original voice of Francesco Di Giacomo. R.I.P. and Il Giardino del mago are among their best tracks ever, and Traccia has always been a live classic. Their live activity was constant and they supported the likes of Curved Air and Rory Gallagher when touring Italy, developing a large and dedicated following. Darwin! is a concept album based on the mankind evolution (a recurring theme in many prog albums of the time) and keeps the same high level of their first album, with nice tracks like the long L'evoluzione and La conquista della posizione eretta. Third album and another milestone in their production, Io sono nato libero, has a shaped gatefold cover with a lyric booklet stapled in. Non mi rompete and La città sottile, both from this album were also released as a single, and all these albums entered the top 10 charts being highly successful at the time. Right after the recordings for the third LP the original guitarist Marcello Todaro (later with Crystals) was replaced by Rodolfo Maltese from Homo Sapiens, that also had a collaboration role in the album. The group needed some time to reorganize with the new line-up and a transition album was released, Banco, with english-sung versions of some of their best tracks and just an unreleased gem, L'albero del pane. Banco del Mutuo Soccorso was trying, just like PFM in the same years, to break the foreign markets, and an english album seemed a good move. The album appeared on ELP's Manticore label, still distributed in Italy by Ricordi, and gave way to an international tour of UK and USA that didn't give the success the band hoped. Coming back to Italy they released in the beginning of 1976 Garofano rosso, a completely instrumental album, soundtrack to the film of the same title, and though the voice of Francesco Di Giacomo is missing, yet the record keeps the distinctive Banco sound, like in the long Suggestioni di un ritorno in campagna. Another album in the same year, Come in un'ultima cena, based on the Last supper biblical theme, the last one with stronger classical influences and some very good tracks like Il ragno and Quando la buona gente dice. This album was also released abroad with the english title As in a last supper. The subsequent album is another highly ambitious work, ...di terra, all instrumental and played with an orchestra, is a good album but not representative of Banco's style. At the end of the 70's the band has a line-up change, with bass player Renato D'Angelo being replaced by Gianni Colaiacomo, but after Canto di primavera the band entered a low-level period with the live Capolinea (the first with the shortened new name Banco), Urgentissimo and the following ones all having a strong commercial feeling that's distant from their first works. Five of the band members (the Nocenzi brothers, Colaiacomo, Maltese and Calderoni) also helped Angelo Branduardi in his 1978-79 italian and european tour and are featured in his 1980 Concerto 3-LP box set. In 1983 one of brothers Nocenzi, Gianni, leaves Banco for a solo career, and he's never rejoined the band, that kept on playing live despite a limited record production. The 90's gave new interest in Banco's music, and the band released a good 3-LP box set (again with a moneybox shaped design, as their first album) with re-recorded versions of their first two albums in longer form. In 1997 a double live CD, Nudo, brings the group to new italian and international tours, even in Japan. Banco are now a six-piece, with Francesco Di Giacomo, Vittorio Nocenzi and Rodolfo Maltese aided by Filippo Marcheggiani (guitar), Tiziano Ricci (bass), Maurizio Masi (drums) and they're often joined by Alessandro Papotto (clarinet, sax, flute). This last member has permanently joined the group by now and he's also playing with Periferia del Mondo, a new band that has released two albums, both strongly recommended, on Akarma (incidentally Francesco Di Giacomo, Vittorio Nocenzi and Rodolfo Maltese, along with PFM original member Mauro Pagani have played on these). 2002 has just seen the band celebrating 30 years since their first album with a great concert in Rome, with Vittorio Nocenzi's brother Gianni rejoining the band after so long, and a handful of dates, including some unplugged ones, to promote Vittorio's solo album Movimenti. The live CD No palco, released in 2003 is taken from the Rome event, with the presence of many guests including Mauro Pagani, is only partially convincing. The small independent label Ma.Ra.Cash has released an official live in 2005, Seguendo le tracce, with the full recording of a 1975 concert in Salerno, and it's a pleasure to hear Banco in perfect form in what's probably their best live album ever issued.